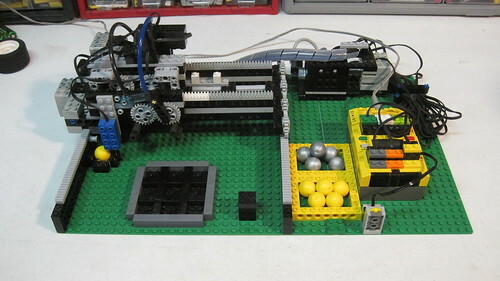 An RCX robot that plays Tic-Tac-Toe. Programmed in RobotC V2.03. I'd appreciate any feedback on the site, robot, video, etc, as I'm just starting to get it all in order. Nice video and website and robot! So, besides cheating, your program os unbeatable, but I think it can still win more often. With the best play, and the first move being a corner move, the second play can only tie by playing in the center. Does your robot exploit that? Yes. It'll always take the center if it can. Most people will usually tie, and sometimes lose against it.